All information provided in this website is believed to be accurate and reliable. RSAA assumes no responsibility for the use of this information. 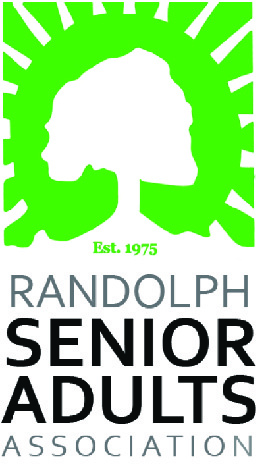 Randolph Senior Adults Association (RSAA) is a nonprofit organization and the community’s lead agency on aging services for adults age 50 and over. If you are an older adult, a person with a disability, a caregiver, or planning for your long-term care needs, RCSAA’s friendly, helpful staff are trained professionals who are here to serve you. RSAA is a United Way agency. To empower adults age 50 and over in Randolph County toward a life of personal independence, healthy aging, social connection and life-long learning. Admission is only $5 each. On Saturday, June 15, the Randolph Senior Adults Association will host the 13th Annual Ms. Senior Randolph County Pageant at the beautiful Sunset Theatre in downtown Asheboro. This annual fund raising event serves as a way to honor Randolph’s senior women, to encourage them to stay active, to recognize their contributions to their local communities and to promote the continued health and wellness for all seniors. Are you interested in participating in the pageant? Click here to download the application. Entries are due by 5pm on Friday, April 26. 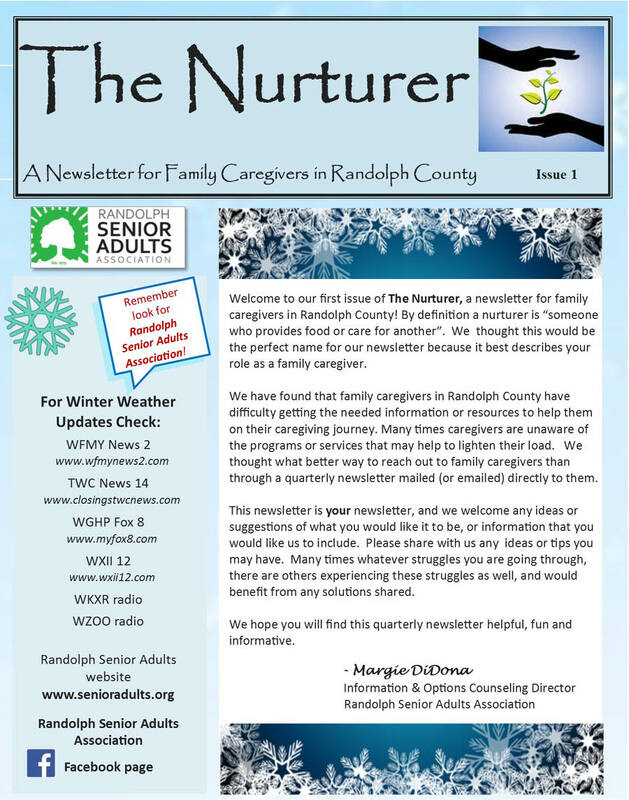 Introducing a new resource for family caregivers! 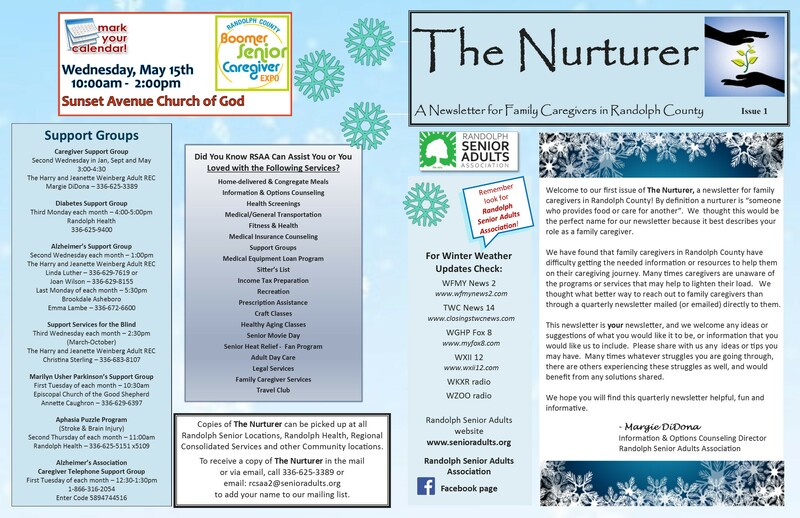 The Nurturer, filled with valuable information for family cargivers in Randolph County. Click here to view a .pdf of the newsletter. The 8th annual Randolph County Boomer, Senior & Caregiver Expo is scheduled for Wednesday, May 15, from 10 a.m.-2 p.m. and is free and open to the public. 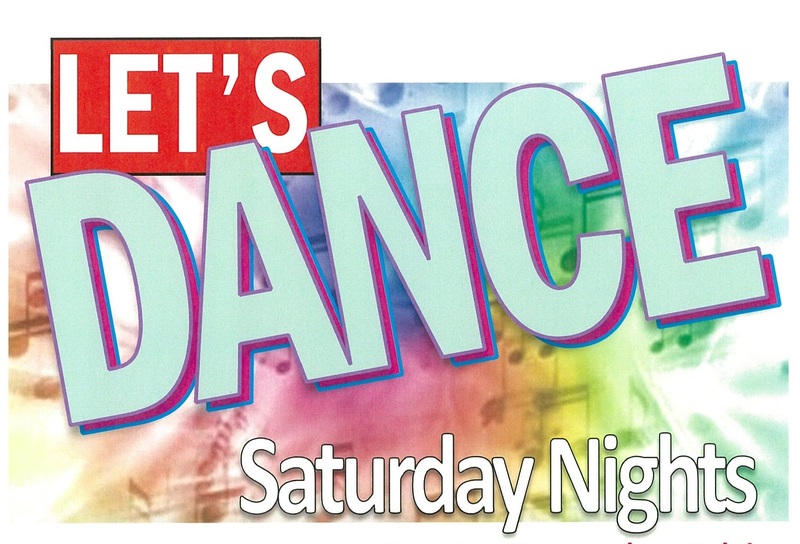 This year’s expo will be held at a new location, Sunset Avenue Church of God, 900 Sunset Ave., Asheboro. The expo will provide an opportunity to enhance the health and wellness of baby boomers, senior citizens and caregivers by connecting them to local resources in their own community. This will be a one-stop opportunity for individuals to learn about resources in the community at a fun and friendly event designed just for them. The event will offer free health screenings, unique entertainment and numerous educational/informational booths.